Dry hair in the morning makes me one unhappy girl! BACK STORY muna: I have a combination of dry-oily hair. In other words, my hair in the morning is a bit dry and sometimes fizzy. Each day, when I arrive in school, my hair has gone through an hour's worth of air pollution it goes through as I commute to work with semi-wet hair. I know its awful! 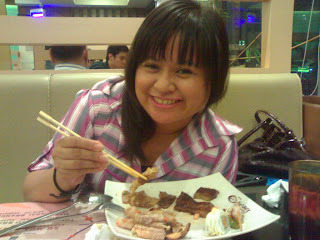 That's my hair morphing to the "greasy" stage. Especially on the bangs and crown area. Then as the day turns to the afternoon, my hair starts to become stringy and greasy. 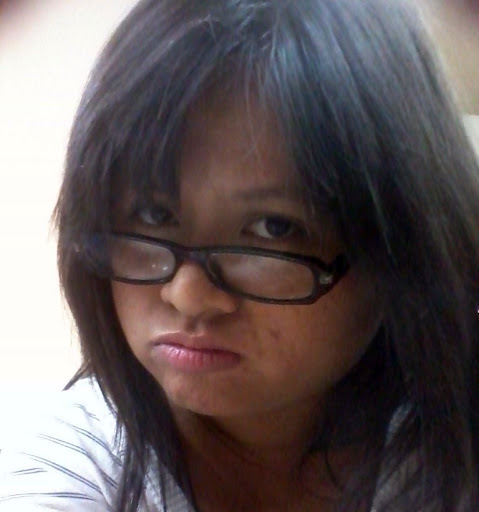 Sadly, by night time, I look like a drowned rat or a "basang sisiw" (wet chick? hahaha sounds weird when I translate it in english!) because of the level of oil in my hair. This is most especially true whenever I condition my hair. (So I try to not do it as often as possible.) I have also tried cuticle hair coats and have had good and bad experiences with it. But I tend to switch brands because somehow I still couldn't achieve the effect of shiny, healthy looking hair all day long (because of the oiliness). I've tried several but the one that I brought with me to the U.S. last year was Vitress Hair Cuticle CoatHeat Protect. The one I brought with me to the U.S. is the one with the big pump! 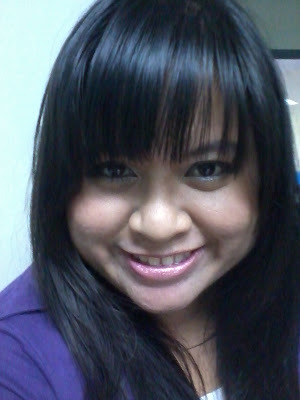 Since I knew the change of humidity will wreak havoc to my hair, I knew I had to have something to tame them. So I brought Vitress Hair Cuticle Coat with me. I chose the one with Heat Protect coz I knew I'd also be blow drying my hair a lot. I swear it made a difference! I'm so glad I brought it with me. So how did Vitress help me out in my dilemma? 2. The product's viscosity is just right. Meaning, its not too runny or too thick. You can control the amount you want by squeezing the small tube. 3. When poured on hand, it feels light and not sticky. 4. A small amount of Vitress Hair Cuticle Coat (like the size of a penny or a 5 centavo in our currency) is sufficient enough for medium to long hair. But you can apply more especially if you have thick hair. 4. The fragrance of the product is delightful! When applied, you can really smell it and its not overpowering but just good enough to make you feel good. 5. 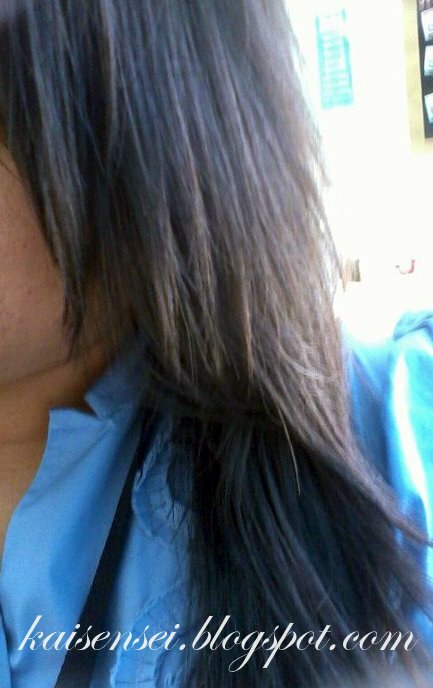 After applying it on hair, a noticeable visual difference takes place. It tames some of the general fizziness of your hair. It doesn't give you a 100% "relaxed" or "rebond" look but you can definitely see improvement. 6. When you run your hands through your hair, the tangles are definitely lessened and its now silky smooth (not oily!) to the touch. 7. It is very affordable compared to other hair cuticle coats in the market. My only negative comment would be about the pump feature of the bigger bottle. It makes it hard to control how much product you want and I hate wasting it. 1. Before you use it, rub the product first on your palm. This will help spread Vitress evenly on your hair. 2. Run your fingers through the lower portion of your hair FIRST. The tips of your hair needs most of the protection that Vitress Hair Cuticle Coat provides. 3. When there is only a very small portion left of product in your hands, that is the time you address the fizziness of your hair. Especially the crown area. 4. To avoid getting that greasy look like mine, avoid putting product on your crown area. But if you really have to (or want to because of the current greasy hair, pat your hair lightly with whatever Vitress Cuticle Hair Coat is left on your palm. Especially if you want to tame the little hairs sticking out of your hair. 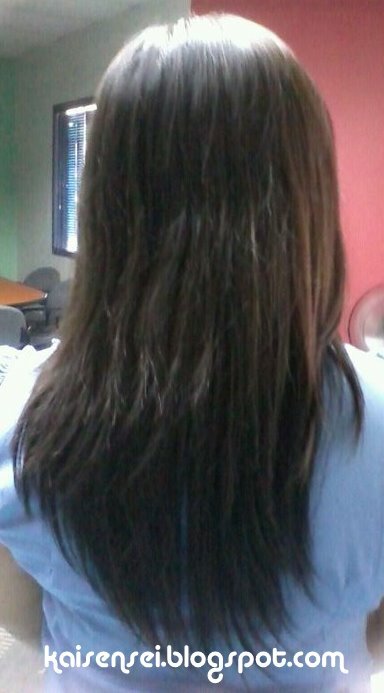 Since I have a combo of dry and oily hair, what I do is that I don't put conditioner on my hair anymore especially during the rainy season. The level of humidity in the air increases the tendency for it to get oily. So I don't put conditioner anymore and just use Vitress Hair Cuticle Coat instead. But during summer, I do condition my hair if not daily or at least every other day. 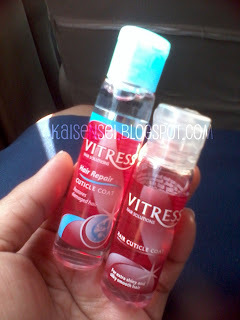 My favorite Vitress Hair Cuticle Coat right now is the Vitress Hair Repair Cuticle Coat (blue one). Mainly because I love its fragrance compared to the others. In the picture below, the red Vitress Hair Cuticle Coat is their regular product. Would I recommend this product? YES I would. Especially to people who have very dry hair. Plus its very affordable and you can buy it at your nearest HBC store, Mercury Drugstore, and Landmark. With Vitress! And I'm wearing my ELF makeup thanks to Diane! Disclaimer: This is NOT a sponsored review but a personal one. I was not paid or compensated for this product review. All info is based from my personal experience. P.S. Hey coffeeholics! Have you liked my Kaisensei's FB Page yet? If you haven't please do and drop by! Would really appreciate it. Also, Vitress has their own FB Page! Be updated and like VITRESS now!